Dracula 4: The Shadow of the Dragon ended up being fairly short as far as adventure games go, but shortly after it was released Microids announced the storyline would be continued in Dracula 5: The Blood Legacy. Although these are numbered sequels the length of the titles appear to be closer to episodic games. Dracula 5 is now available for PC and will be released soon on Mac, iOS and Android. Specific release dates have not been give for the other platforms just yet. Check out additional details and a launch trailer below. Dracula 5: The Blood Legacy is available for $15. Montreuil (France), December 03, 2013. Microïds brings the players face to face with the Prince of Darkness in the final opus of Ellen Cross’ adventures that began in “Dracula 4 : The Shadow of the Dragon”. The ultimate chapter of one of the major sagas of adventure games is available on PC and soon on Mac and will be released shortly on iOS and Android. With more than a million and a half video games sold throughout the world, the Dracula series still sends a shiver to the adventure fans. Last June, “Dracula 4: The Shadow of the Dragon” introduced Ellen Cross, a art restorer in charge of identifying a piece of art that reappeared in Budapest a few weeks after supposedly disappearing at sea. Her curiosity took her all around the world on the steps of a painting with mysterious origins, linked to the myth of Dracula. “Dracula 5: The Blood Legacy” takes over the investigation right after the final revelation of “Dracula 4: The Shadow of the Dragon”. Ellen is back at the New York Metropolitan Museum with the strange painting. Revelations about the characters, an occult society, information about Vlad the Impaler, alias Dracula… The secrets behind the painting will lead the players in the heart of darkness and make it possible to make light of all the interrogations on hold since the last opus. On her way throughout the adventure, Ellen will meet old acquaintances, allies or enemies, but also new faces who will slowly guide her towards the inevitable confrontation with the original vampire. 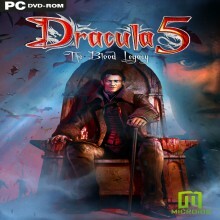 “Dracula 5: The Blood Legacy” is a first person game, with a 360 degree view and click and point moves. Observation and reflection are necessary for the players to overcome the dangers on their way. Players must interact with the environment, combine and use advisedly the objects gathered on their way or unlock more or less complex mechanisms. More than fifteen new puzzle games are included, as well as different brain-twisters to be solved to move on in the story. Find their way in a foggy maze, print a map with the Vampire King’s blood, turn the electric sign on… The players’ powers of deduction and imagination will constantly be needed. All the important information is gathered in a journal that can be referred to any time so that the players can pick up the thread of the story at any moment. The game offers two modes. The Adventure Mode, for the fans, does not include any interaction markers and it is not possible to pass the most complicated puzzle games. The Casual Mode, dedicated to casual gamers, includes all this support. The players can win up to twenty trophies once specific actions are carried out in the game. A score is allocated according to their ability to solve puzzles. “Dracula 5: The Blood Legacy” is fully dubbed in French and English and includes English, French, German, Italian and Spanish subtitles. It is available since December 02, 2013 on PC and soon on Mac and will shortly be released on iOS and Android.